L’Occitane soap. Walking into a L’Occitane boutique is always such a great sensory and tactile experience. I love the muted, pure scents they produce, and I love the work they do for their producers in Provence and in Burkina Faso. In addition to their fabulous shea butter hand cream, I love their soaps. I don’t use them everyday as they’re expensive, but I try to include a couple of bars over the endless Chicago winter for a little pampering in the shower. I’m partial to three scents: lavender (a classic! ), milk (so pure and clean), and lemon verbena (so refreshing). Stila In The Light palette. I’ve heard so many good things about this palette. I’m a neutrals girl at heart, and I love that this palette gives me plenty of neutrals in both matte and shimmer finishes. I had the Naked 2 palette, and I found that there was just too much shimmer in the shadows for it to be my everyday go-to. That palette went to my sister, and I think this would be a much more versatile replacement. It also comes with a full-size espresso/dark brown eyeliner that has gotten great reviews on its own. Urban Decay Revolution lipstick. Again, I’ve read great review after great review about this new line from UD. I’m looking for a rich berry/plum color – not too bright, but not too dark – that’s the perfectly rich shade to complement autumnal tones of oranges, reds, and greens. I’m thinking the shade venom might just fit the bill. FRESH Sugar lipbalm. This will actually be a refill for me. This balm in rose (the pink tube) is the most beautiful flush of pink that on my lips is so soft and natural. It’s a super easy product that provides some SPF protection along with a great tint of color that helps me look put together with just one swipe. Bonus: I adore the tin packaging and the lemony scent. Giorgio Armani Luminous Silk foundation. During the summer, I always reach for tinted moisturizer, but in the fall, I find that I want a little bit more coverage. With the colder weather, I can tolerate a little bit more makeup since I’m not afraid to have it all melt off. I have yet to try this specific foundation, but it comes highly recommended by close friends. I think a product that claims to provide medium coverage that feels light as air while still giving a tinted-moisturizer glow and the added benefits of minimizing pores deserves a try by me. Oribe Dry Texturizing spray. I’ve been wanting to see if this product really deserves its Holy Grail reputation. I’ve yet to find a dry shampoo I really like, and I’ve also been meaning to find a product that will do something interesting yet low-maintenance with my hair. I love the fact that my hair is thick, but thick hair often becomes a tricky exercise in volume. I think this could introduce an effortless dose of trying to do something with my hair without too much expertise/added time to my routine. TARTE Amazonian Clay blush. My skin tone loses a lot of its golden undertones in the fall/winter, so I find that I need a little bit of color to compensate. I’m a NARS anything blush type of girl, but the colors on these blushes are so pretty. The color tipsy seems like it would give a lovely flush of color to my winter-tone cheeks without going over the top. Tom Ford Eyeshadow Quad. I have yet to give in to the temptation of Tom Ford makeup – it’s not exactly easy on the wallet! But I saw this quad in Orchid Haze, and I was smitten. The colors are so pigmented yet refined. Eyeshadows are my Achilles heel in beauty – I think my eyes are my best feature so I tend to go crazy on eye products. On the flip side, they’re definitely the products I use most, so the cost/use equation is pretty justified (or so I think). But $78 is a lot for eyeshadow, however nice. Here’s hoping for a gift card. One’s 25th birthday is a good reason to buy something so lovely yet so exorbitantly priced, right? Essie Shearling Darling Winter 2013 Collection. Essie nail polishes are my go to when it comes to my tips, and this collection has such great colors. I’m determined to be much more selective with new nail polish purchases, so while a couple colors caught my eye, I really am eyeing Parka Perfect – I’m a sucker for moody grays. Sephora Collection Flawless Moisturizing Lotion with SPF 15. I’ve already gone through two bottles of this product, and I have yet to find anything I like better for the price, smell, and effect. I love the lightly fragranced smell – light and refreshing without that medicinal scent that “light fragranced” or “non-fragranced” products tend to have. I love the built in SPF 15. I love the way it feels on my skin – not too oily, and I don’t feel like I need to use a lot. My one gripe with the product is with the way it’s packaged, I never can tell when that last pump of product is coming. I’m currently making do with one of my night time moisturizer right now (I just add some Neutrogena sunscreen beforehand to make up for the lack of SPF) since I hit that dreaded last pump last week and I haven’t had a chance to run to Sephora for a refill. That’s probably a good thing for my wallet though considering how long this wish list is! My sister tends to give me a gift card to Sephora for my birthday in November, so I’ll save some of the want-more-than-need items until then and cross off some of the more necessary/less pricey items first. 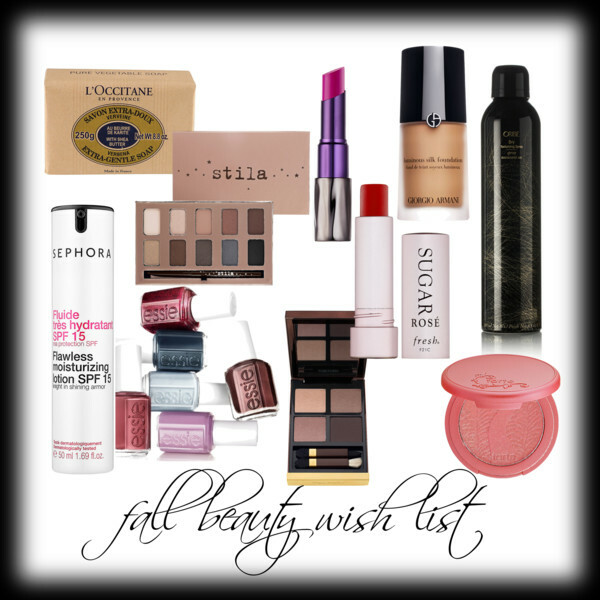 What’s on your fall beauty wish list?